I am a subscriber of Wateen WiMax since 24th Dec 2007, apart from the three months tenure (Aug-Nov 2008) when there were no coverage, I have been its active user. 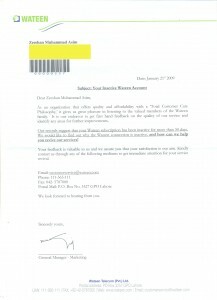 After receiving and reading through the letter that is dated 21st Jan 2009 and dispatched on 23rd Jan 2009, I am pretty sure that the people at Wateen do not know how to operate things especially their billing, marketing and support departments. so basically are u still using that connection or what ? Of course, am still using it … although I launched a new query with their Customer Support department to ask what does this letter really mean. The problem with me is that its the only option I have, I cannot have a DSL via PTCL lines because I am too far away from the telephone exchange. Even tried the new fiber optic line. Hi Asim! 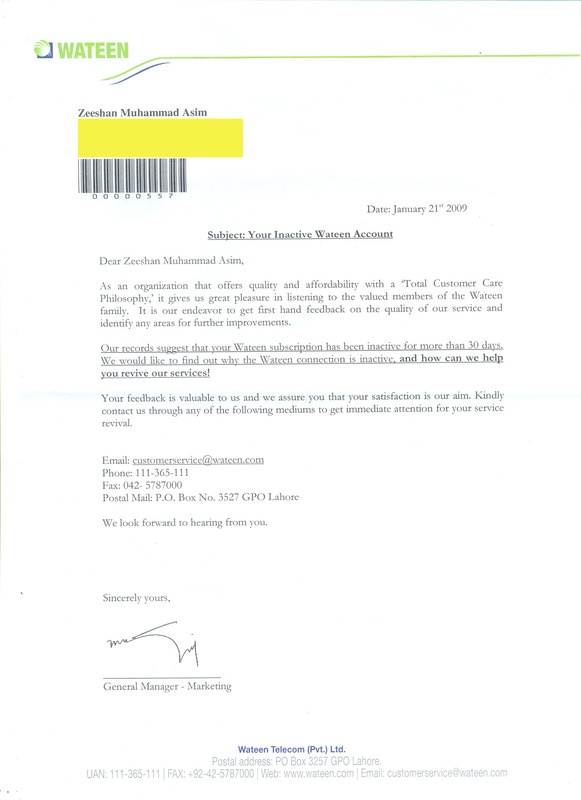 I received the same letter a while back even though I have terminated Wateen's services and am now using a LINKdotNET 1 mbps student package. I was reluctant to get in touch with them for fear they would bring up some hidden charges that I STILL have to pay…do tell me what you were told when you called them up? I am from Wateen CS. If you have concerns/feedback regarding our services, we encourage you to contact us at customerservice@wateen.com. Please include your user ID and contact number. We are here to help. Imran, my story was that when I called and launched a complaint I was told it may be a mistake from Wateen's end.